Exciting drainage and plumbing business for sale in Glasgow South. Established over 13 years ago, the business currently has a turnover of ?1.2 million. The business employs a team of 23 which includes drain engineers, plumbers and office staff. Failure to prepare your franchise business for sale can affect your ability to sell it; it can affect the price you achieve and can also affect the ability of the potential buyer to raise the finance they may need. Franchise Finance can help ensure this does not happen. 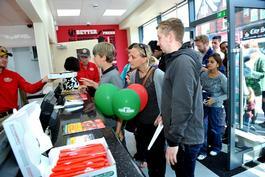 Around 90% of new Papa John’s franchisees buy the licence to run a brand-new pizza outlet, opening up in a new area. However, as Papa John’s continues to expand, there is an increasing opportunity to purchase a re-sale store. Nazim Vadiwala has recently taken over the Leith Walk Papa John’s store in Edinburgh. Nazim who worked for a rival pizza firm for 10 years now manages Leith Walk with the help of operations director. Here why Nazim,and fellow Papa John’s franchisees decided to go down the franchise resale route. Kevin and Rose Hooper have run their own Snack in the Box franchise in Plymouth & Cornwall for over 11 years. Unfortunately, due to ill health, their business is now up for sale. This is an ideal opportunity for a couple or individual to buy into a business that offers instant cash from day one. Why buy a franchise resale? Chris is a highly experienced business consultant with a successful track record in banking, creating business plans and delivering financial training. Chris and the team at Franchise Finance support franchisees looking to prepare their franchise for resale and can give advice on valuation and how to maximise the sale value of your business. They are also able to assist the incoming franchisee by helping them arrange the finance needed for buying the business. Recognised as one of the leading experts in franchising, and is the Managing Director of whichfranchise, Johnny has been actively involved in franchising for over 20 years. Johnny has a specific interest in franchise resales and helping franchisees in their exit planning. He is also able to assist those looking to buy a resale. Richard Holden is Head of Franchising for Lloyds Bank. He has 32 years banking experience and has supported a wide range of businesses in the small business sector for many years. He is responsible for providing support to the Lloyds Bank Business Managers, assisting them in assessing proposals from prospective franchisees. He is also responsible for ensuring that the network of local business managers has up-to-date information on the franchise systems operating within the UK.